Click on thumbnail to view high-resolution image. Happened across this photo during one of my trawls of the web and thought this one is definitely interesting and esoteric enough to warrant a post. Probably (obviously?) a Northrop publicity photo showing Northrop F-20 Tigershark prototype (82-0062) leading a pair of Tiger IIs. The further aircraft is a Royal Malaysian Air Force RF-5E Tigereye (I believe M29-20/80-0334 which was delivered to the RMAF in late 1983 while the nearer aircraft is Northrop's in-house F-5F Tiger II twin-seater N9139Y which served as a chase plane for the F-20 program. In a twist of fate, F-5F N9139Y ended up a stone's throw away from RF-5E M29-20, for when the F-20 program was cancelled in late 1986, Malaysia's neighbour Singapore purchased the aircraft together with 2 other F-5Fs as part of its last batch of two-seaters. This F-5F was assigned the USAF serial 86-0388 (RSAF serial 862) and delivered to Singapore via Prestwick, Scotland in 1987 carrying a hybrid Northrop paint scheme and RSAF roundels/serials. 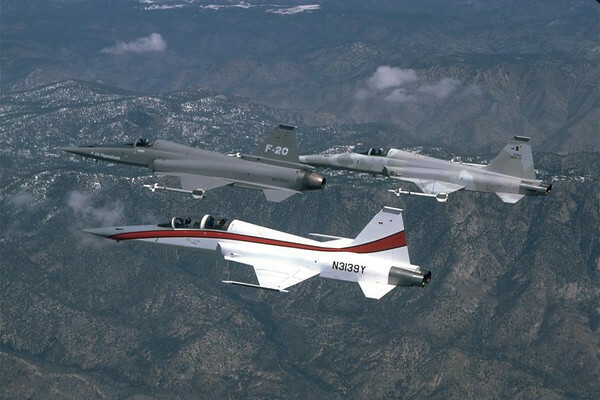 Both aircraft are still in service today with their respective owners, with the twin-seater having been upgraded by Singapore Technologies Aerospace to F-5T standard with new radar and avionics.